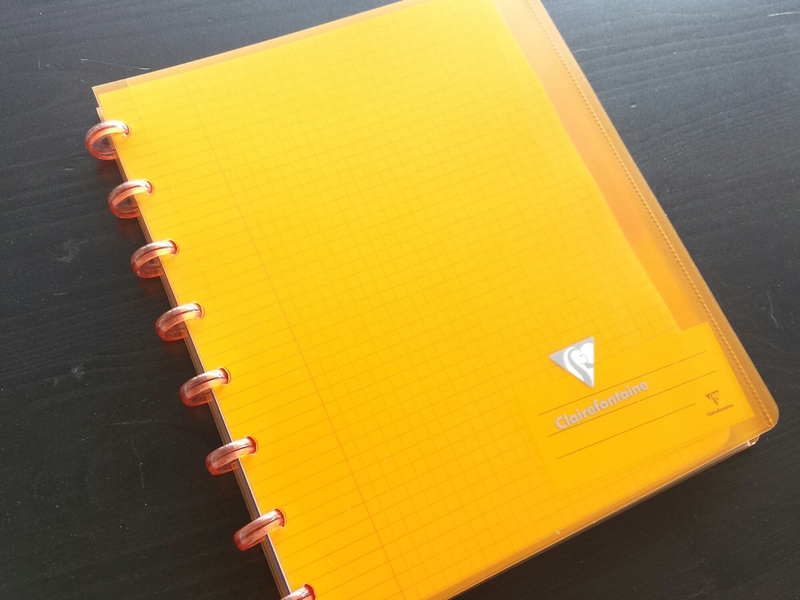 “Clairing” is the name for the Atoma-style disc binding system that Clairefontaine makes (“cahier Clairing”). 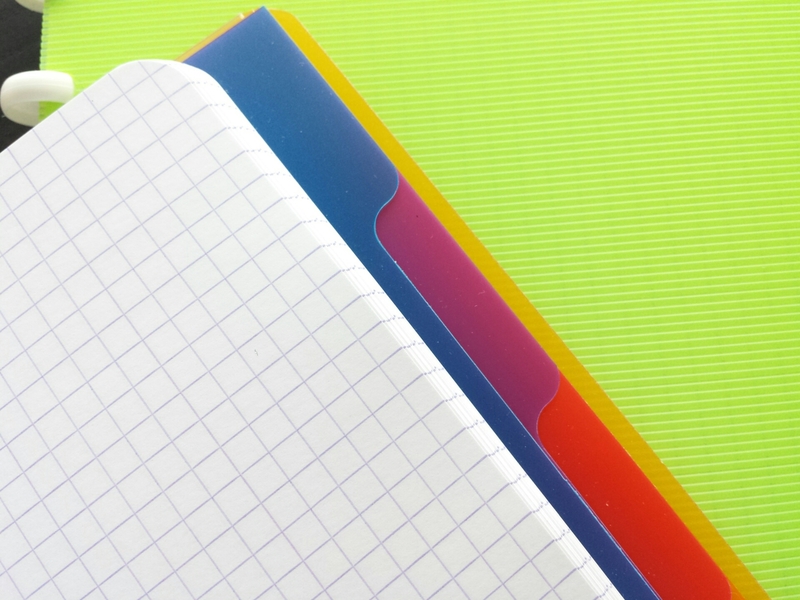 I got to know of Atoma notebooks through the posts on Bleistift and Lexikaliker, but for the longest time did not realize that my local stationery store (Nota Bene in Montreal) carried them. I finally picked a couple of them up on my last visit. 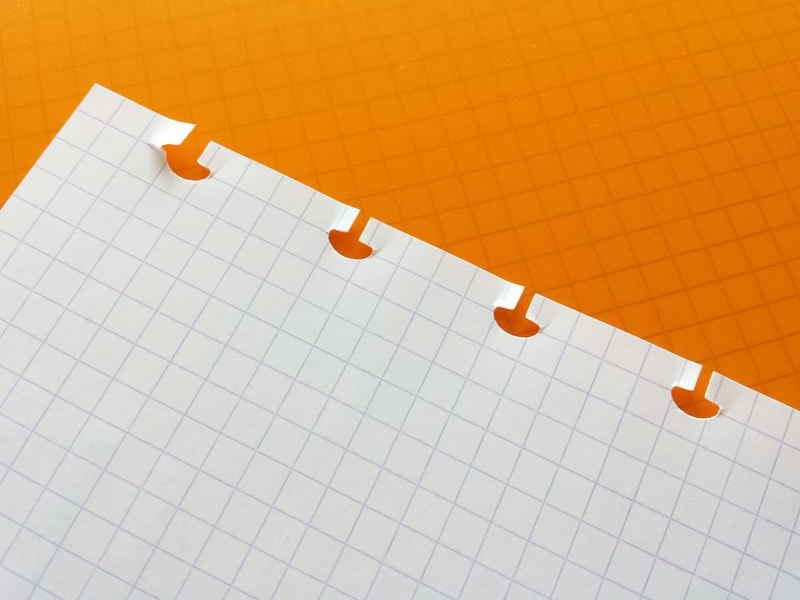 The basic Atoma-style notebooks come with cardboard covers. While they are the most reasonable in terms of price and performance, the disc-binding system by its nature is reusable, and manufacturers have been coming up with pricier versions that have sturdier covers. 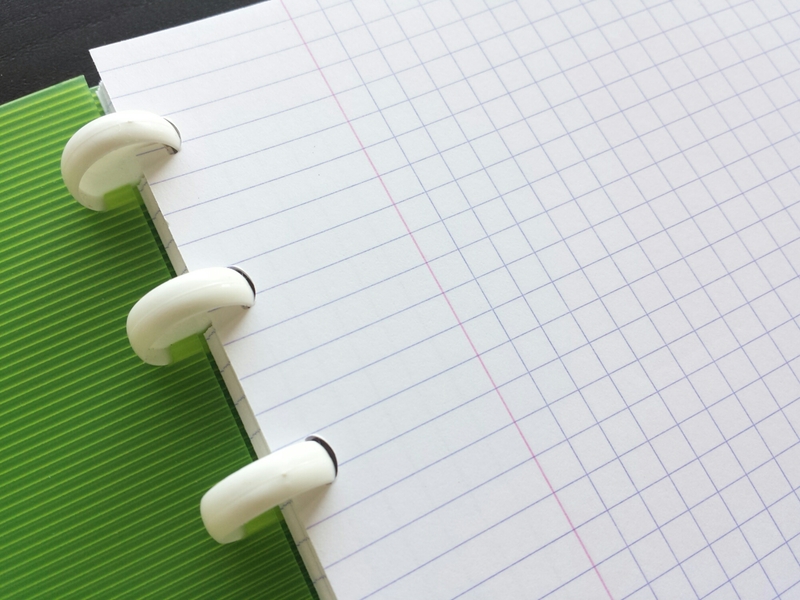 In Clairefontaine parlance, the basic Clairing notebook is classified under the Metric line. The next step up, with white plastic discs and ribbed transparent colored plastic covers, is called Linicolor. 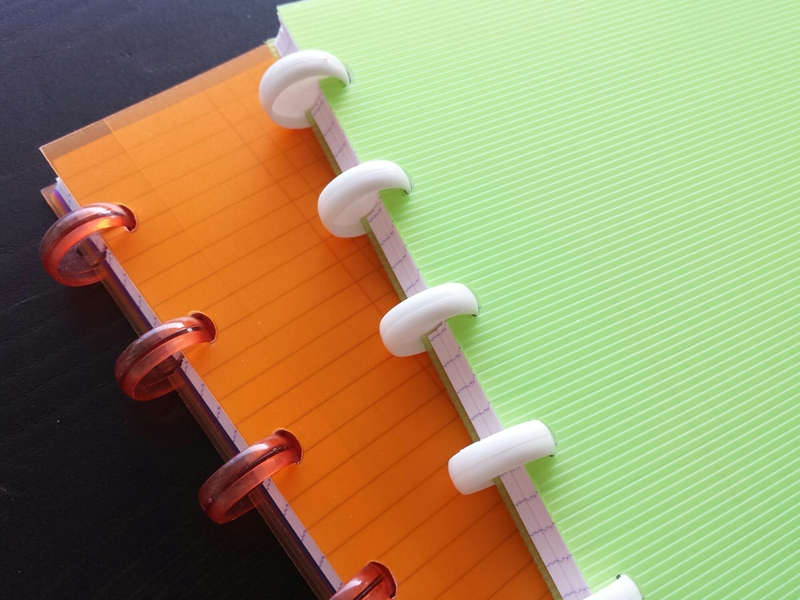 The nicest-looking version is called the Kover Book, and comes with transparent rings, a matte plastic cover with front and back flaps, and five section dividers. As far as I could see in the store, Atoma had products corresponding to the Clairefontaine ones that looked very similar and cost about the same (CAD $10 for the Linicolor and $17 for the Kover Book). I chose the Clairefontaines because I liked the paper better. I’m used to this sort of Rhodia-style treated vellum paper, which is smooth and takes fountain pen ink well. Atoma paper (as I felt in the store) seemed thinner and a bit more “toothy” (less treated). I wonder if the paper (either Atoma or Clairefontaine) can withstand frequent removals and reinsertments? It looks as if the discs are more similar in size to the Atoma discs than to the Staples discs, which is nice. I think the bigger the discs the more annoying to write on the paper left of the discs (if you are right handed). I have never seen the Clairefontaine system ‘live’. I hope I’ll come across it to be able to compare it to Atoma. I didn’t realize that disc sizes could differ across systems! But in the store I certainly had the impression that the Atomas had very similar dimensions as the Clairings, because the notebooks were stacked together and it was only by looking at the logo on the cover that I was able to tell which was which. I like the idea of these disc bound books too, having first seen them on Bleistift (in their Atoma form). I must try one soon! Thank you for the review. 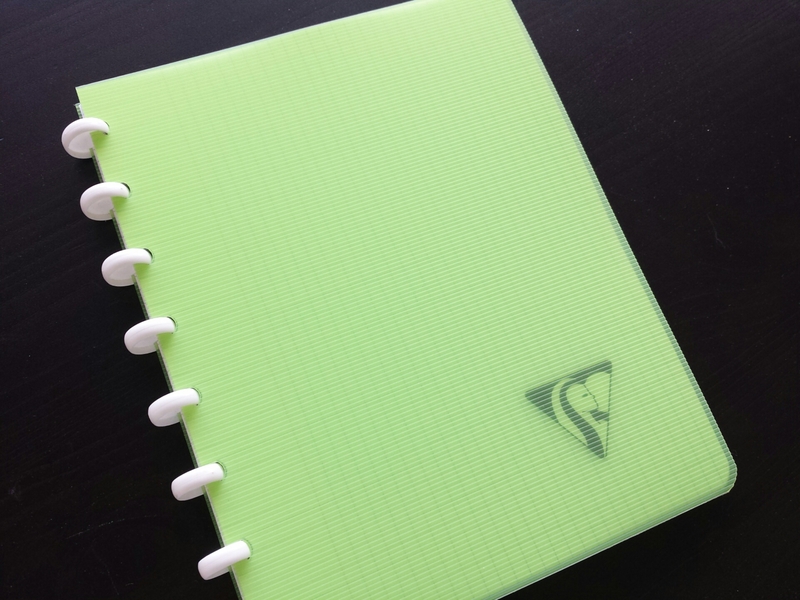 – I enjoy the Atoma notebooks very much. In the past I have tried one or two alternatives but found the original to be the most appealing because of the disc size. The Atoma books have the smallest discs, and this does not only look better but makes writing on the opposite side easier (just like Matthias said). Gunther, thank you for the clarification on the size of the discs. I actually thought you might prefer the original Atoma, but for different reasons – Atoma paper seems more pencil-friendly than Clairefontaine’s (this being a purely personal opinion). I like Clairefontaine because I use fountain pens, but I have found on certain occasions that heavily treated/coated paper such as Clairefontaine or Maruman Mnemosyne can feel a bit slippery when writing with pencils. 저도 클레르퐁텐 노트 좋아하는데. 이것도 클리어 특유의 깔끔함이 있네요. 유럽에서도 프랑스나 벨기에 등 몇몇 나라에서만 쉽게 구할 수 있는 것 같아요. 북미도 어렵구요. 제가 산 문구점은 이메일로 문의하면 mail order는 받아주는데 캐나다가 워낙 배송비가 비싼 나라라서 아마존 계열이 더 저렴할 것 같긴 하네요.